Powerful and reliable threephase industrial vacuum for the recovery of wet and dry materials. Suitable for collecting high quantities heavy materials. Powerful 7.5 kW, it creates a great vacuum combined to a great airflow and is so perfect of heavy materials. 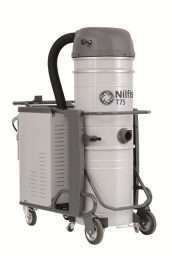 Can be used as a suction unit in centralized vacuum systems. Included M class filter, suitable for the collection of toxic dust and is. Practical release container system for easy emptying.